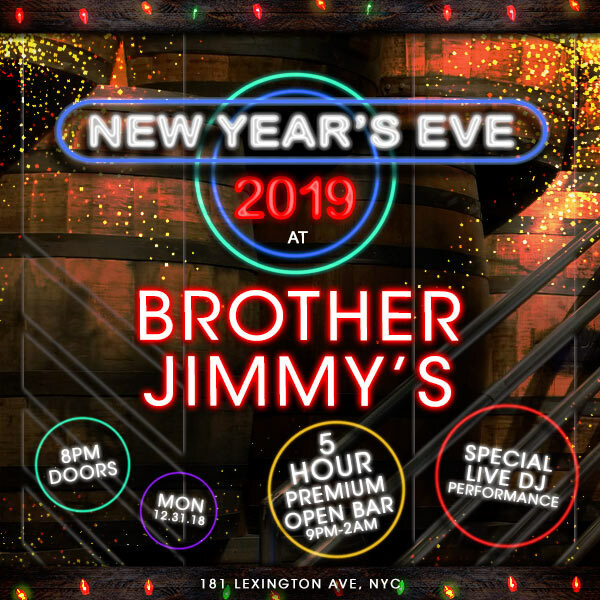 Head to New York City’s favorite watering hole, Brother Jimmy’s BBQ, for a wild and festive New Year’s Eve celebration. This Murray Hill sports bar is known for its lively football Sundays and for bringing charming southern hospitality to New York City. This NYE, Brother Jimmy’s BBQ is serving up an incredible night of New Year’s merriment in the heart of NYC. Opt for a no-frills, all-fun New Year’s bash at Brother Jimmy’s BBQ in New York City. Indulge in some liquid spirit at the 5-hour premium open bar and break out your dance moves as a live DJ spins open format Top 40, Hip-Hop, House, and Mash-Ups. As midnight approaches, gear up for a roaring DJ-led countdown and ring in the New Year with a complimentary champagne toast. Looking for a more luxurious experience? Choose from a selection of VIP packages for exclusive amenities like reserved table seating and bottle service. Brother Jimmy’s BBQ in New York is a vivacious venue providing a touch of down home comfort. The folksy décor delivers a pleasant twist on your average NYC sports bar with license plates, string lights, neon signs, and rustic wood beams creating a welcoming college town vibe. This southern slice of home in the heart of New York City doubles as a nightlife staple and is a crowd-favorite among celebrities like Eli Manning, Nick Lachey, and Joey Fatone. This New Year's Eve, Brother Jimmy's BBQ is your destination for a spirited New Year's celebration to remember.